Obama’s Jerusalem speech: He empathized with Israelis and asked them to do the same for Palestinians. Obama reaches out to Israelis—and asks them to do the same for Palestinians. Busloads of wisecracking Israeli students in T-shirts and jeans crushed up against a gate for over an hour in the hot sun, lining up at 1 p.m. for a 5 p.m. speech by Barack Obama. Each tried to outdo the other in performing American-accented English (Israelis, as it turns out, can do flawless American accents, whereas Obama’s Hebrew sounds like Siri talking). Trading insults and jokes and snapping photos (“Look, the Technion students are finally getting off their air-conditioned bus, they must be opening the gates!”), it could have been the ordinary Israeli not-line for the usual Israeli event. Most of the students were secular, although a fair number of religious youngsters were present, as well as Arab students and extremely orthodox Haredim. I heard some English, but very little. The organizers were true to the promise that Obama would speak to Israeli students, first and foremost. There was the usual press to get through the main gate, a pair of security checks inside the large Jerusalem performing arts theater, and then some mild rioting at the ice-cream sellers, where people who had been lined up for two hours in the baking sun bickered over the omnipresent Israeli not-line and why the medium sized scoop was the same as the extra large. The stage was decorated with massive flags and secret servicemen, and the crowd was respectful through the singing of both the Israeli and American anthems (where did so many Israelis learn the “Star Spangled Banner”?). And when the president jogged up to the podium, without fanfare or introduction or any preamble, they were delighted. They stayed delighted. Through the hard truths and the awkward pauses, they applauded and stood and roared. Often whole paragraphs were drowned out by clapping. The lingering impression of the whole week has been that Obama had this country at “Hello”—that Israelis wanted to love Obama; they just needed to hear that he loved them too. So he loved them, as only Obama can do. He started with a joke diffusing the reported tensions between himself and Benjamin Netanyahu, as mere fodder for Israel’s comedy shows. Then he offered an eloquent explanation of the ways in which Passover—which begins Monday and for which most of us should have spent yesterday vacuuming crumbs from the cracks in our sofas—has inspired Americans. He held out Martin Luther King, Jr.’s version of the Promised Land as a charge to Israelis to keep working to make Israel a truly promised land. He reaffirmed his support of the Zionist project, and the students roared. He said that Americans and Israelis weren’t just joined by common interests but by shared mutual values, and as he began to explain why he preferred speaking to students, whose optimism and energy inspired him, an Arab student stood up at the back of the balcony and began shouting at him about the occupation. As the student was removed by security, Obama joked that he “wouldn’t feel comfortable if I didn’t have at least one heckler.” The crowd stood and applauded. Then the president launched into the meat of his speech: about security, peace, and prosperity, and the links among them. He started by clarifying that he understood the ways in which fear for their safety had made these Israeli youngsters who they are today. He talked about the struggles of their grandparents and the endless wars of their parents. The implication was that this generation needed to move past that. His reference to Iron Dome drew tremendous applause, as did his promise to stand with Israel against Hezbollah and Assad in Syria. 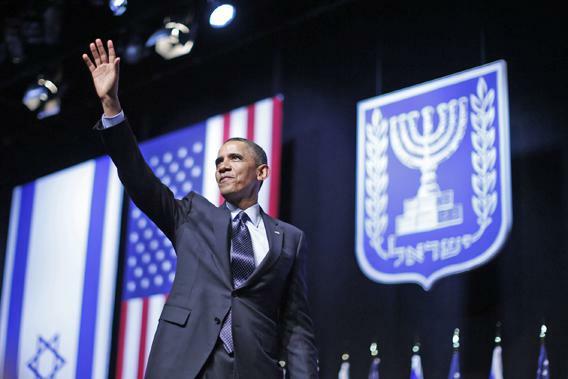 Obama said “those who adhere to the ideology of rejecting Israel might as well reject the earth beneath them or the sky above them, because Israel is not going anywhere.” After another standing ovation, he offered the Hebrew phrase “atem lo levad” (you are not alone). That seems to have been all the Israelis needed to hear from him. Obama urged these young people to recognize that the era of their leaders making peace with autocrats was at an end; that “peace begins not just in the plans of leaders but in the hearts of the people.” He asked the students to understand that only “empathy in the hearts of the people of this land, this sacred city” will lead to peace. The last part of his speech was dedicated to the prosperity and ingenuity of Israel; its ten Nobel prizewinners and its role in the world economy. He chuckled at Israelis for their dedication to social media, then urged that all of Israel’s prosperity and promise “can be enhanced with greater security and lasting peace.” He closed with a thank you to the Jewish people who had infused his life with a spirit of “Tikkun Olam” – the quest to repair the world. Then he asked the audience to do their part in that project. I asked the students around me what they thought of the speech. Most were moved and inspired by the eloquence. Even more so, they were grateful that the President had made the effort to see their neighborhood through their eyes. Obama was asking them to make that same cognitive connection with their neighbors. He was modeling how it’s done. Maybe that isn’t enough. But as he made clear, without it, there can be no start.